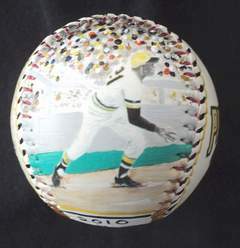 This Great American Roberto Clemente Baseball features my two original paintings of the "Great One". 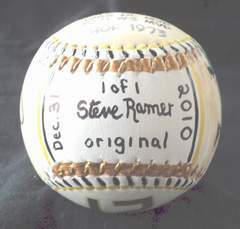 A certificate of authenticity comes with your baseball so that you know it's an original Great American Baseball. 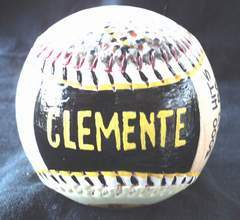 Side two is my painting of Roberto's 3000th hit. Click here for a closer look. 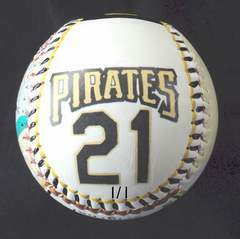 Side three shows the Pirates logo with Clemente's famous number 21. 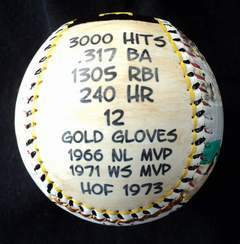 Side four has some of Clemente's statistics and awards including the year he was elected to the Hall Of Fame, 1973. 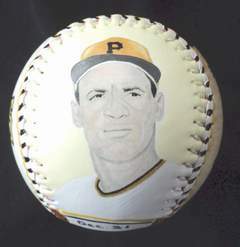 Side five, which is the top of the baseball, has CLEMENTE hand painted in Pirates colors.